What is UKMidSS? Why is it exciting that all alongside midwifery units (AMUs ) in Scotland, England, Wales and Northern Ireland are involved? How can you find out more, and stay in touch? Dr Rachel Rowe, who leads UKMidSS, and Catherine Williams, Vice Chair of the UKMidSS Steering Group, explain……. The Birthplace study showed the importance of carrying out high quality research in midwifery-led settings. It also showed that there is an appetite amongst midwives for getting involved in research that relates directly to their practice. 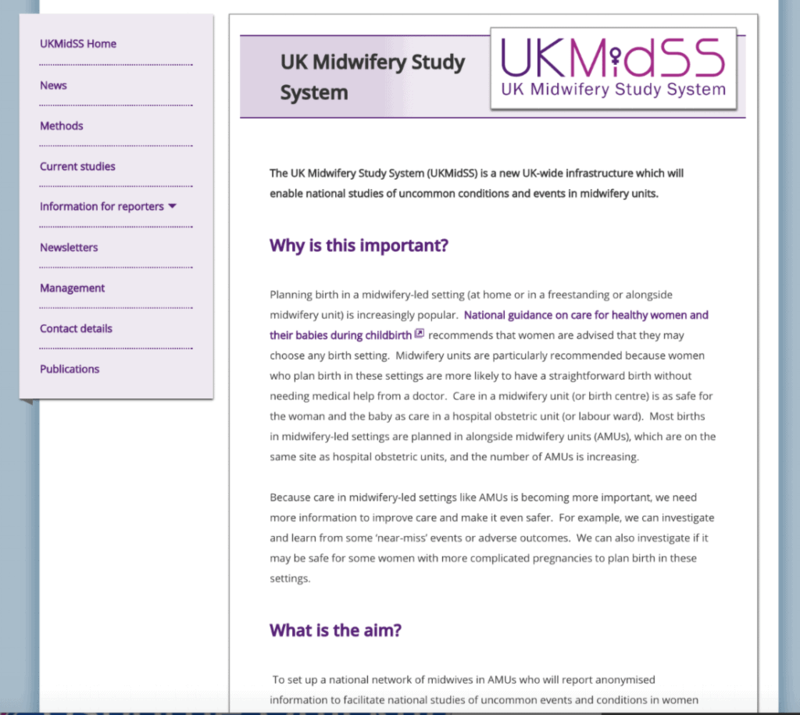 Building on this, UKMidSS has been set up as a new national system for carrying out research studies in midwifery units. Funded by the National Institute for Health Research (NIHR) and co-ordinated by a research team at the National Perinatal Epidemiology Unit (NPEU) in Oxford, UKMidSS is a national collaboration currently involving over 200 midwives from 122 units across the UK. For Catherine, as a service user representative on the UKMidSS Steering Group, the exciting thing about UKMidSS is that midwifery units are now well-enough established as part of the maternity landscape to be the subject of research in their own right. 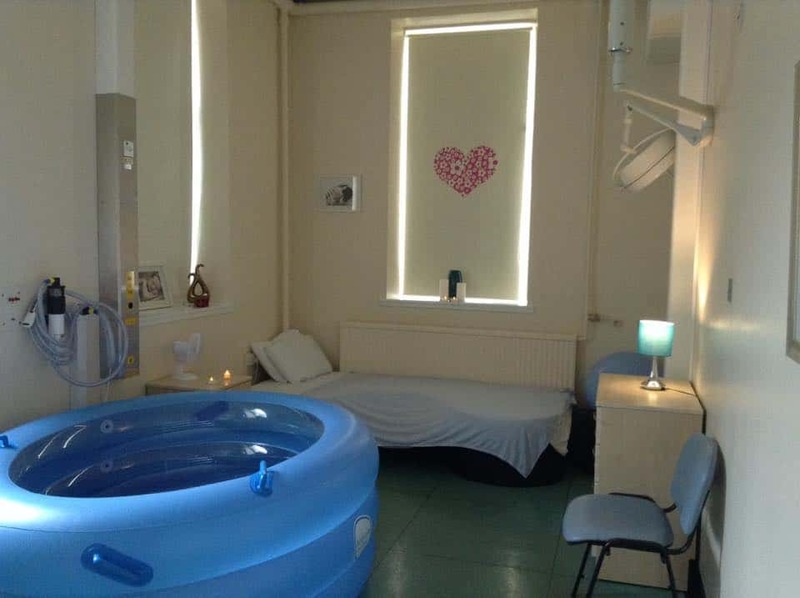 As more new midwifery units open, and more women have the option of planning birth in an alongside (AMU) or freestanding midwifery unit (FMU), research carried out in these settings will be increasingly important so that women can make informed decisions about planned place of birth and other aspects of their care. So how does UKMidSS work? If you’re really research-minded you can read the details in the UKMidSS protocol, but in simple terms UKMidSS is a platform for carrying out research. And the easiest way to explain how it works is to consider the kinds of questions that can and are being answered by UKMidSS studies. The best available evidence shows that healthy women at low risk of complications who plan birth in a midwifery unit are more likely to have a straightforward birth without medical intervention, with no difference in safety for their baby, compared with planning birth in a consultant-led hospital unit. Of course the key national guideline here is NICE CG190 Intrapartum Care for healthy women and their babies (2014). Catherine was a lay member of the guideline development group, and you can read more about the guideline (and the various versions – plain English, flowcharts, recommendations, and full evidence and text) on her blog here. Coming back to UKMidSS, we know that midwifery units, and possibly AMUs in particular, are also used by some women who may be at a ‘higher risk’ of complications during birth, that is they may have one or more of the medical conditions or other factors listed in the NICE CG190 planning place of birth recommendation as factors which may affect planned place of birth. There is very little evidence on the numbers of women planning birth in midwifery units “outside the guidelines” in this way or on outcomes for these women and their babies. Using UKMidSS we can carry out studies to investigate questions like these and the first UKMidSS study is doing just that by focusing on women who are severely obese (with a BMI>35kg/m2 at booking) and admitted to an alongside midwifery unit for labour care. · What proportion of women starting labour care in AMUs are severely obese? · What are the socio-demographic and clinical characteristics of these severely obese women? · How do the outcomes for severely obese women (and their babies) starting labour care in AMUs compare with outcomes for women of normal weight starting labour care in AMUs? Since January of this year, midwives who are our ‘UKMidSS reporters’ in all 122 AMUs across the UK have been collecting data to answer these questions and will continue to do so until the end of December. Every month they tell us how many ‘cases’ of severe obesity they have seen in their unit. They also tell us about the number of admissions and births in their unit so we have a ‘denominator’ to work out what proportion of admissions are severely obese. Then when they report a ‘case’ they follow up by sending more detailed data on that woman and two comparison women or ‘controls’. The idea is that these ‘controls’ are representative of the general population of women admitted to AMUs so we have a good comparison group. All UKMidSS studies use anonymised data routinely recorded in women’s notes which is reported to the UKMidSS team using specially designed secure web-based systems. We also aim to focus on relatively uncommon events, conditions or outcomes so that the burden of data collection shouldn’t be too great. But why is it important to focus on uncommon events? Just because an event or outcome is uncommon this doesn’t mean it isn’t significant and of interest to women and their families. Our first study is evidence of this, but it also clear that some uncommon outcomes in particular may have a disproportionate impact. We know from Birthplace that serious poor outcomes are uncommon in midwifery units, but we also know how big an impact these can have on women and their families, so it is important to continue to investigate uncommon poor outcomes in midwifery-led settings. Because these outcomes are uncommon, UKMidSS can provide an infrastructure for this kind of research. In 2017 we will be investigating cases where a baby is admitted to neonatal care following birth in an AMU. Admission of full-term babies to neonatal care is a key indicator for the safety of maternity care. NICE CG190 recommends transfer to an obstetric unit when certain complications arise during labour in a midwifery unit, but we know from Birthplace that around 40% of poor outcomes in babies occurred in births which took place in the original planned birth setting, i.e. where no transfer took place. Admission to neonatal care following birth in an AMU is therefore a potential marker for an event where different care might have made a difference to outcome. This study aims to identify maternal characteristics and aspects of care during labour, birth and the immediate postnatal period which may be associated with neonatal admission. As with all UKMidSS studies the research questions for these studies have been developed with input from the multidisciplinary Steering Group which includes women, midwives, doctors and research experts from across the UK. We are looking to expand the involvement of the midwifery community in UKMidSS. UKMidSS is already creating a community of practice in midwifery research, beginning with AMUs. UKMidSS reporters – one or more in each AMU – and the managers and colleagues supporting their participation, are facilitating research that matters to women and that has the potential to develop research capacity in midwifery. We are very excited to be holding our first Study Day for UKMidSS reporters in November, where we will be getting together to hear some preliminary findings from our first study, to network, share experiences and to generate ideas for future studies. Then, dependent on further funding, we will be looking to expanding UKMidSS to include FMUs as well. We are particularly keen to hear from midwives who have ideas for future UKMidSS studies or who would like to work with us to develop a study idea. Rachel is delighted to be connected with MUNet through her involvement as a member of MUNet’s advisory board. You can catch up with both Rachel and Catherine at the RCM’s Annual Conference in October 2016. Look out for further conference appearances and blogs when we have news of our first study results. In the meantime you can stay in touch with us by following us on Twitter @NPEU_UKMidSS @RachelRowe3 @BerksMaternity, or by reading the UKMidSS newsletters https://www.npeu.ox.ac.uk/ukmidss/newsletters (sign up to be notified about newsletters by emailing ukmidss@npeu.ox.ac.uk). Rachel Rowe is funded by a National Institute for Health Research (NIHR) Post Doctoral Fellowship (PDF-2014-07-006). This article presents independent research funded by the NIHR. The views expressed are those of the authors and not necessarily those of the NHS, the NIHR or the Department of Health.